National Academicians are professional artists and architects who are elected to membership by their peers annually. They represent some of the most distinguished practitioners in their respective fields. In January 1826, the first group of members of the organization was elected. Following this, two categories of membership were established, Associate (ANA) and Academician (NA). Artists were elected on the basis of recognized excellence. 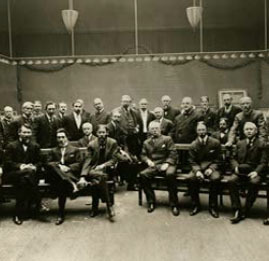 Up until 1869, the body of members was drawn exclusively from the immediate New York area, and up until the turn of the century ANAs and NAs had to exhibit in a given year’s annual to be considered for election. Upon the establishment of the first constitution, members were required to give a diploma or qualifying work in his or her medium. Early members almost uniformly ignored this rule. Indeed, none of the founders gave a diploma work to the Academy, with the possible exceptions of Morse and John Frazee. The tide began to turn in 1839 upon the revision of the constitution and by-laws, which included the requirement that Associates present a portrait of themselves. The response to the Associate and Academician requirement picked up as the 1840s progressed, stimulated by the new ruling and the beginning of a systematic effort by the council to document the acceptance of portraits and diploma works. The goal of forming a collection was stimulated on by the desire to amass a body of work that would represent for posterity the styles, tastes, and contributions of the organization’s members. The Associate membership designation was eliminated in 1994, bringing an end to the portrait requirement. Today, elected members work with the Academy’s curators to select a representative work to give to the collection which is now comprised of over 7,700 works. The diploma submission brings the member’s status from NA-Elect to full National Academician, entitling him or her the right to participate in future elections, vote on institutional matters, serve on the Board of Governors and committees, and more. Over 2,100 artists and architects have been elected since the Academy’s founding, and there are nearly 420 living Academicians, including the recently-elected Class of 2017. New members are nominated and elected in a confidential process organized annually by the Membership Committee. At the beginning of the year, the committee sends out a call for nominations, and typically each full Academician the ability to submit up to three nominees. Any living artist or architect who has made a significant contribution to American culture is eligible. The nominator submits a letter of recommendation and gathers letters of support from two other current Academicians, the nominee’s biography, and a selection of images of the nominee’s work. The Membership Committee reviews the nominations and then shares them for consideration with the rest of the Academicians at the Winter (General) Meeting. A few months later, the nominees are voted upon at the Spring (Annual) Meeting. In order to be considered, each nominee must receive a minimum of 100 votes, and in order to be elected, at least 60% of the votes must be in favor. In the fall, the new members are celebrated and welcomed into the fold at the annual Induction Ceremony and Party. The President presents the new class to the current members and supporters of the Academy, and gives each new member a pin and certificate that officially commemorates the election. In 1826, membership was limited to 30 Academicians and 30 Associates. In 1829 the number of Academicians and Associates was increased to 50 for each category. In 1843, the number of Academicians was decreased to 35. In 1852 the number of Academicians was back to 50; in 1882 number of Academicians and Associates was set to 100 for each category. In 1903 membership was set at 100 members. Due to the merger with the Society of American Artists in 1906 membership increased again, arrayed among the professional classes: 125 painters, 25 sculptors, 25 architects or engravers. The constitution of 1907 codified this increase as well as a distinction between active members and those members who by decision of the Council were declared unavailable for active service by reason of residence abroad. Membership quotas increased several more times in the 20th century, until 1994, when the professional quotas and the classification of Associate member were eliminated. In 1994 membership eligibility was expanded to the current limit of 450. Since its founding, the National Academy has been housed in a series of venues in New York City, including the Old Alms House (1825-1826), the Arcade Baths (1827-1830), Clinton Hall (1829-), and the New York Society Library (1840-1847). 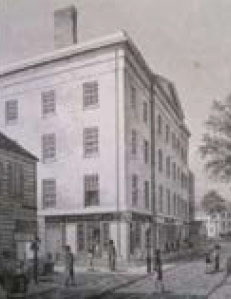 In 1848, a building dedicated to the National Academy was opened on lower Broadway between Amity and Mercer Streets. Then, in 1860, a building site at 23rd Street and Fourth Avenue (now Park Avenue South) was purchased for the erection of the first permanent home of the Academy. 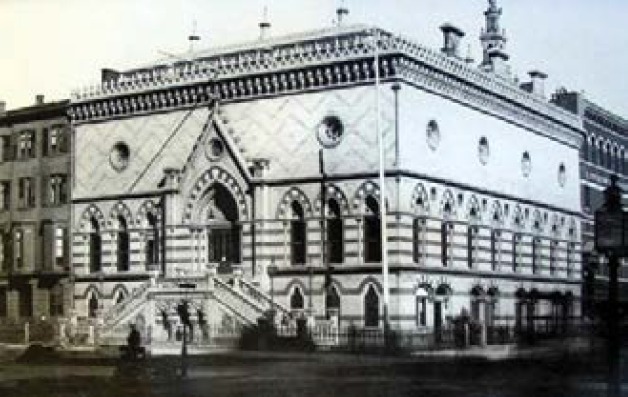 Designed by architect Peter B. Wight, the structure was a Venetian Gothic Revival building, popularly known as the “Doge’s Palace”; it opened in 1865 and housed the offices, school, and exhibition facilities. A New York City landmark, the building was sold in 1899 to the Metropolitan Life Insurance Company, and later demolished. Remnants of the façade can be found on Our Lady of Lourdes Church at 465 W. 142nd St. Between 1900 and 1940 the Academy was again without a permanent home. 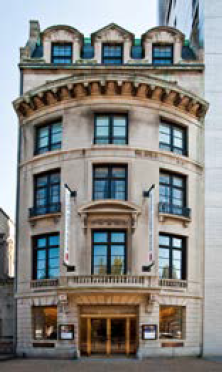 The School was located at 109th Street and Amsterdam Avenue, while the Annual exhibitions were held in the galleries of the American Fine Arts Society at 215 West 57th Street. Plans had been developed by the leading architectural firm of Carrère and Hastings for a large structure to be built in upper Manhattan, but were never realized because of financial and logistical problems. From 1942 to 2017 the Academy resided in a Beaux Arts-style mansion on the Millionaires Row portion of Fifth Avenue at 89th Street. The mansion was originally the home of Archer Milton Huntington (1870-1955) and his wife, sculptor and National Academician Anna Hyatt Huntington (1876-1973). Huntington was the heir to the fortune amassed by his father, railroad magnate Collis Huntington, an owner of the Central Pacific and Southern Pacific railroads, among others. The Huntingtons lived in this house until 1939, when they gave the building and surrounding properties to the National Academy and moved to their country estate. A major philanthropist, Archer Huntington was also a naturalist and a scholar who specialized in Spanish history, art, and literature. 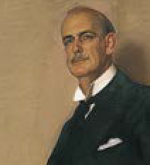 He is best remembered as the founder of the Hispanic Society in New York City, the Mariners Museum in Newport News, Virginia, and, with his wife, Brookgreen Gardens in South Carolina. In 1902, Archer Huntington purchased several properties along Fifth Avenue between 89th and 90th streets, including a comparatively small house at number 1083. In 1913, he hired the architect and interior designer Ogden Codman, Jr., to enlarge the house, turning it into the mansion it is today. Codman, who was a colleague and friend of Edith Wharton, tripled the size of the residence by adding a large wing at the back, opening onto 89th Street. He remodeled the existing interiors in the French Renaissance Revival and Neo-Grec styles he favored. The second floor was designed for entertaining; on the third floor were the living quarters for Archer Huntington; and, after his marriage, in 1923, his wife had a five-room suite on the fourth floor. A number of small bedrooms for the more than 25 servants were located on the fifth and sixth floors. An expansive space on the fifth floor, which had a large skylight, was refitted as the sculpture studio for Anna Huntington. The Huntingtons lived in this house until 1939, when they gave the building and surrounding properties to the National Academy. The couple then moved to their country estate. Following Archer Huntington’s death, in 1955, Mrs. Huntington maintained a studio and a small apartment in the Academy’s building until shortly before her death at the age of 97. Throughout the 1940s, the Academy wrestled with continued financial crises, and in 1950 was forced to sell one of the properties gifted by the Huntingtons – at 1080 Fifth Avenue, 1 E. 89th Street. That same year, the former school on 109th Street was sold to pay for the construction of the School at 5 E. 89th Street.